Introduction... The following short biography is from "The History of Washtenaw County, Ann Arbor Township, page 997, 1881, and is presented here as a means of introducing the author of the diaries. Hon. 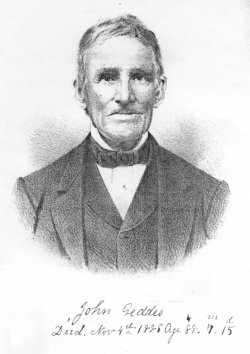 John GEDDES, familiarly known as "Uncle John Geddes" throughout the length and breadth of Washtenaw county, was born in Londonderry tp., Dauphin (now Lebanon) Co., PA in March, 1801. His father and mother and three of his grandparents were born, lived and died in Pennsylvania. The other grandparent, William Geddes, was born near Randallstown, County Antrim, Ireland, in 1735; came to Pennsylvania in 1752, and died in Cumberland county, Pa, in 1780. Mr. Geddes was reared in his native State, and when old enough was sent to school a mile or two distant. At the age of 14 years he left school, and in that year finished the only education he ever obtained within the four walls of a school room. When he was about 23 years of age he concluded to make a trip to the Territory of Michigan, and if the land suited him, to locate in that fine and fertile region. He accordingly did so, and after a long trip on Lake Erie on the steamship Superior, Capt. Bunker, he landed at Detroit July 12, 1824. The following day he started westward, and arrived at Woodruf's Grove (now Ypsilanti), where he remained overnight. On the morning of the 14th, he came to the spot where now is located the city of Ann Arbor. The country thereabout suited him, and believing fully in the fertility of the soil, he proceeded to locate a farm on the southeast quarter of sec. 8, in what is now Pittsfield tp. He paid for the tract of land July 21, 1824. After a short time spent in the new country he went back to Detroit, and obtaining passage on the same boat that brought him to Michigan, he returned to Pennsylvania. On April 19, 1825, Mr. Geddes, in company with his brother Robert, left their home in the East for Michigan. They arrived at Ann Arbor May 11, 1825. Both purchased land and on June 14, they settled on sec. 36, Ann Arbor tp. where Mr. Geddes has since resided. In the fall of 1826 Robert Geddes built a saw mill on the Huron river near his land, and Uncle John went to work for him at $10 per month and board and washing. From that time until March, 1868, with the exception of one year in the same business on Fleming creek, Mr. Geddes continued to work in the saw-mill. The greater part of the time he would be at work before daylight, and never cease his labors until darkness compelled him to desist. 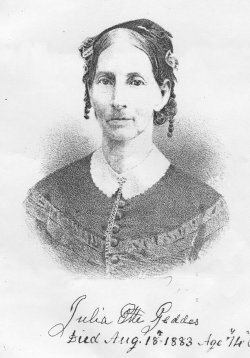 Mr. Geddes was married April 6, 1837, to Fanny Savage, who was born in Orange county, NY, Feb 19, 1806. Three children were born to bless this union, 2 daughters and 1 son: Rachel is married but has no children; Sarah is also married, and has 2 sons and 3 daughters; John remained single, and died April 30, 1878. Mrs. Geddes departed this life Dec. 4, 1855, and on June 1, 1856, Mr. Geddes married Juliette Savage, a sister of his first wife, who was born July 22, 1809. The former Mrs. Geddes was a faithful member of the Presbyterian Church, as is Mr. Geddes and his present wife. In politics, Mr. G. was an Anti-Mason, and afterward became a Whig. When the Republican party was organized Mr. Geddes enlisted under its banner, where he has remained until the present time. He was elected to the State Legislature in 1840, and was Supervisor from Ann Arbor tp. for many years. He has been a Justice of the Peace for over 20 years. "Uncle John Geddes" is a man possessing remarkable physical and mental faculties for a man over 80 years of age. He walks from his residence at Geddes in Ann Arbor, without experiencing the least fatigue. His memory is without a parallel. He can distinctly recollect the arrival of each and every old pioneer within the borders of Washtenaw county up to 1835 or 1840, and rarely fails to name the exact day and month of any social, political or educational feature of the county's growth since its organization. The publishers of this work and the citizens of this county owe "Uncle John Geddes" a debt of gratitude for his untiring energy and steady perseverence in collecting facts for this volume, that can never be repaid, and his name will be held in grateful rememberance. I landed in Detroit July 12th 1824. Started for Washtenaw County the same day and arrived at Johnson tavern on the Rouge in the evening and remained all night there. (My companion was William F. Stevens, of Steuben County, N. Y., aged 52 years. Out first acquaintance was on the Steam Boat that landed us in Detroit, I was 23 years old then). Johnson town was where Wayne Village is not. The next day we came to Woodruff Grove in the Huron where the first settlement of the Washtenaw commenced. The next day, which was Wednesday the 14th of July, we went to Ann Arbor, past where Robert Flemming was then building a sawmill on the S.E. ¼ of Sec 25 township of Ann Arbor which was the first sawmill erected in the county. It commenced running in the fall. Robert Flemming was an Irishman. His residence then was in Lewiston, Niagara County, N.Y. He never resided in Michigan. The sawmill he built was not a profitable investment for him. There was an Orchard planted near the sawmill, afterwards, which was probably the first orchard of apple trees planted in the township, if not in the county. The same day we past where they were building the sawmill we past where Onie White and his family were living on the farm he still owns and occupies. His residence then was about 50 rods North of where it now is. We crossed the Huron on foot waiding the stream near where the Monroe Bridge now stands. We arrived Ann Arbor before night and in rambling round we came to a log house in which a Mr. Bushnell lived. He had a young woman, who had a child, keeping house for him. Bushnell, I was told, was not married. Bushnell left these parts long ago. Onie White and Bushnell's houses were all I saw in what is now Ann Arbor township. After being in Ann Arbor vicinity one more day, we went back to Woodruff Grove on Friday, the middle trail. There was no house there and that was the French trading house. The name there was Waterford, named from a good spring of drinking water, which was there. As water was very scarce at Woodruff Grove, of any kind, I went home shortly after and next May when I got back again, Waterford was Ypsilanti and some more houses in the place. About the first Lane, 1825, the Chicago Road was run through Ypsilanti, which decided the contest between Woodruff Grove and Ypsilanti. The first frame barn, that I recollect of, that was built by Ann Arbor township was built by Elder Moses Clark, a Baptist Minister. It was built on the N.E. corner of Sec 25 in the Spring of 1827. The first Master mill in Washtenaw and probably in the State, was built by Francis E. Eldred of Detroit in Geddesburgh on the Short of the N.W. fractioned quarter of Sec. 36. The frame was put up in the fall of 1840 and Millright work in the winter following. The first Plaster ground was by Seneca falls. It was dark colored and sold slowly. The Plaster mill was a poor investment it did not pay its cost. Some Grand River plaster was ground. But for some years past nothing but Sandusky plaster has been ground and sold in the year 1847. The plaster mill was bought by R.+ J. Geddes, who now owns it. The first school house was built on W 1/2 of S.W. ¼ of Sec 25 in the fall of 1827 and Sally Clark was the first teacher. Sally died a few years ago. Mr. Erastus Priest built the first two story frame house in Ann Arbor village. At least I heard him telling that one day. It was disputed at the time but finally conceded. Click on the year below to access diary entries (not all years transcribed.). Click on the link below to access the vital record extractions from the John Geddes Diaries. The original “Waste Book” Diary of John Geddes is found in the “Geddes and Randall Family Papers, 1835-1909,” Michigan Historical Collections, Bentley Historical Library, University of Michigan, Ann Arbor, Michigan. A special Thank You to Timothy Kreh who generously donated copies of John Geddes’s diary and to Denise Frederick for transcribing the diary.